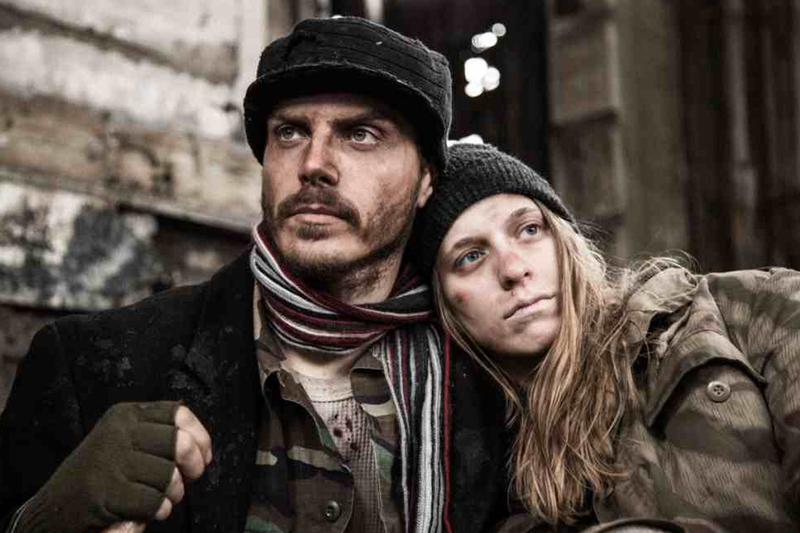 After a prize-winning film festival run last year, John Klein’s Glass City Films’ post-apocalyptic zombie feature landed a North American DVD distribution deal starting next week. “Chrysalis” will be re-titled “Battle Apocalypse” when it launches Feb. 24 by Barnholtz Entertainment via digital platform Cindeigm. Indie “Battle Apocalypse” was written by 2007 Columbia College graduate Ben Kurstin, who was the film’s cinematographer. The story is about living in the aftermath of the apocalypse, where survivors Joshua (Cole Simon) and Penelope (Sara Gorsky) are survivors of a deadly infection that laid waste to humanity 25 years ago. When they encounter fellow survivor Abira (Tanya Thai McBride), their lives are forever changed as they journey across a barren, decayed world and fight off zombie-like infected creatures that once were human. The project was “incredibly ambitious from start to finish,” says Klein, who directed the cast of 35 and large crew. One of the film’s biggest challenges was finding locations that presented an abandoned, decayed dystopian world. Kurstin says he wrote with locations in mind, in Gary, Chicago, Downstate Ullin and Cairo. Skeleton crews additionally scouted and shot in places that fit the tone and texture of the story. Caleb Thusat and Brittny Heinrich produced; Mike Molenda edited; production design by Max Trainment; art direction by Jesse Gentry and music by Darren Callahan. From the start, “Battle Apocalypse” had a groundswell of support, says Klein, “first through the Kickstarter campaign that raised $35,000, and now out on the festival circuit,” including many “specialized” horror/sci-fi genre events. “Apocalypse” stars Sara Gorsky won Best actress in four horror fests and Cole Simon was named Best actor in one. “Battle Apocalypse” so far this year is scheduled at 15 festivals, including Boston Sci-Fi, Dead Walk Fest, Durango Independent, Miami International Science Fiction, Green Bay, Beloit International and Bare Bones Indie Film and Music. It’s currently available on VHX at www.TheRestAreDead.com and Vimeo On Demand for streaming or purchase and will be on sale at retailers in-store and online, including Walmart, Best Buy, Amazon.com, K-Mart, and Movies Unlimited. Linda Frothingham is founder of Chicagohollywood and board member of the Chicago Screenwriters Network. Contact, frothideas@comcast.net.